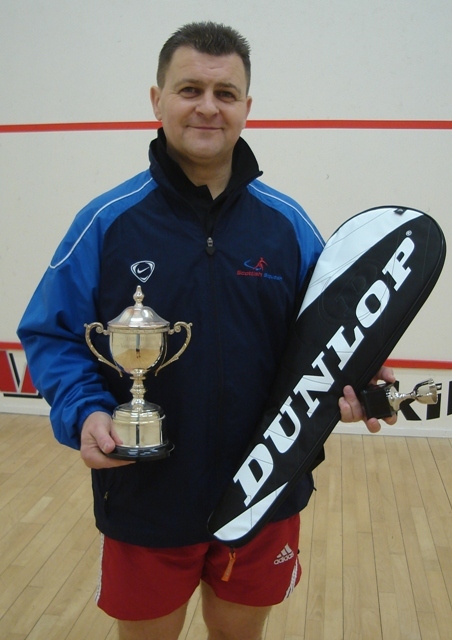 Jimmy Wells, the present Nunholm Club Champion, with a fine example of attacking squash as ever, recently added the West of Scotland Masters title to the Stonehaven Masters which he won in September. Jim had a troubled season last year with injuries but still managed to represent Scotland at the Home Internationals in May. Nunholm has been represented at over 40/45/50/55/and even over 70s in the tournaments held in Autumn 2008. Sue Strachan managed a creditable runners up performance in the West of Scotland and Jim Scriven in particular was Wellsy’s biggest threat in the over 45s in Stonehaven. Coming up for Dumfries and Galloway Squash players is the Dumfries and Galloway Closed Championships held at Nunholm over the week beginning December 1. Entry fee is £2. All entries should go to Jim Wells by November 23. Competitors don’t need to be international standard to play in this tournament, the more the merrier! The club is hoping for a good turn out from not only Nunholm but also Thornhill, Lockerbie and Castle Douglas clubs. Everyone will get at least two matches as all first round losers will be entered into a plate competition.